ceylon cinnamon + apple galette with vanilla sugar. gluten free, dairy free, refined sugar free chocolate peanut butter pie. mixed berry pie. sweet potato pie with toasted marshmallow topping. apple pie with crumb topping. pumpkin cheesecake with a ginger browned butter crust. easy caramel apple pie with crumb topping. gluten free blueberry crumb pie. sweet potato pie. brown sugar pumpkin pie. pear and almond cream pie. salted chocolate pecan pie. 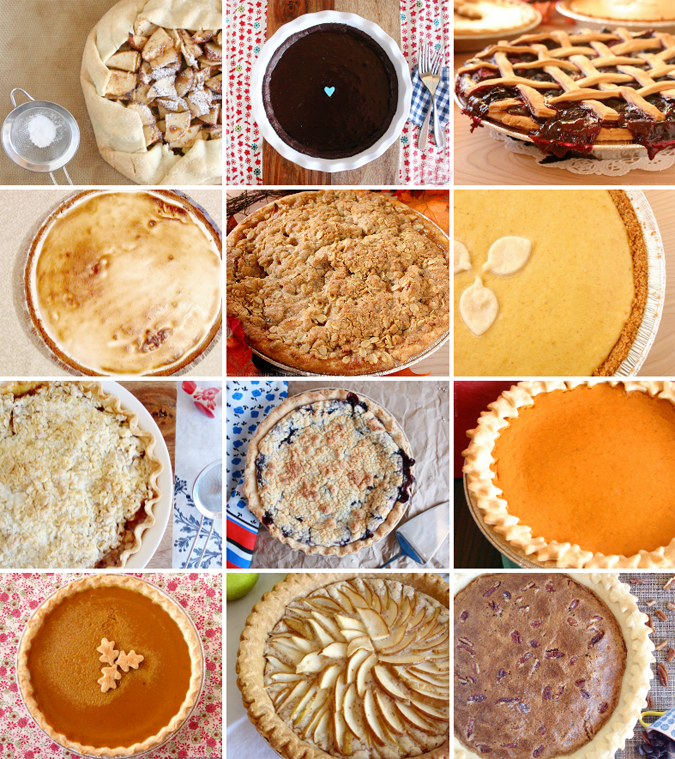 Making your own pie this Thanksgiving shouldn't be a hassle or a stressor. Even if you're not the most experienced baker, you can still show up to your family get together with a delicious homemade treat. These recipes go from super duper simple to a little more involved, so choose according to your liking. You can also alter some; for example- want to do the pear cream pie but fanning the pears out makes your nervous? No sweat! Just throw those pear babies in the crust. Want to make the sweet potato pie but that star crust topping has got you freaking out? Leave it off! Short on time? Buy a pre made crust and just make the filling! No need to head out to your local bakery this year- here are 12 yummy and easy pie recipes you can make for your family! You continually amaze me with all these recipes..amazing! Oh girl, you're too kind. So hope you're able to find something fun to make! Fruit pies! Yum!!! Any idea of what you're going to make? And I LOVE the idea of a Thanksgiving for just you two! We may have to try doing that as well. It really, really was. Thank you for it! We're doing a Thanksgiving for Two mainly because I really wanted to cook my family Thanksgiving but my mom won because they're moving so it will be the last holiday in my childhood home. So I gave in and I'll just cook a smaller version for Seth and I (and William will eat a little bit of green beans and squash and applesauce for dessert).